Get Them Started Early! | So What? I run. I LOVE that my friends encourage their children to run. Too often I see overweight children and it saddens me. I’ve had conversations with parents who tell me their children are “big boned” or just “husky” and I bite my tongue because there’s not sense in fighting a losing battle with a parent who’s in denial. I can’t imagine the lives these children will have as adults and the struggles they will face because their parents are making poor decisions for them. Yes, there are children who have medical problems…I get that, but I can’t believe that one in three American children have medical problems. And I understand that it can be difficult to eliminate the sweets and video games and TV, but our children are worth the extra work it takes to turn them into healthy adults with healthy habits. Just the other day, I ran with my friend and her daughter in the BWC 5K. Little Lulu (not her real name of course) struggled from time to time, but she pushed through like a champ! She was so funny telling everyone that this was her 4th 5K. How can you not be impressed with that? She’s only 8! My other friends had their children run in the kids fun run and all were so proud of their accomplishments, as well as they should be! Running is a great way to spend time with your kids and get them healthy and active at the same time. Not only does running or any kind of physical activity help kids build strength and endurance, but it helps build confidence and allows kids to feel better about themselves. 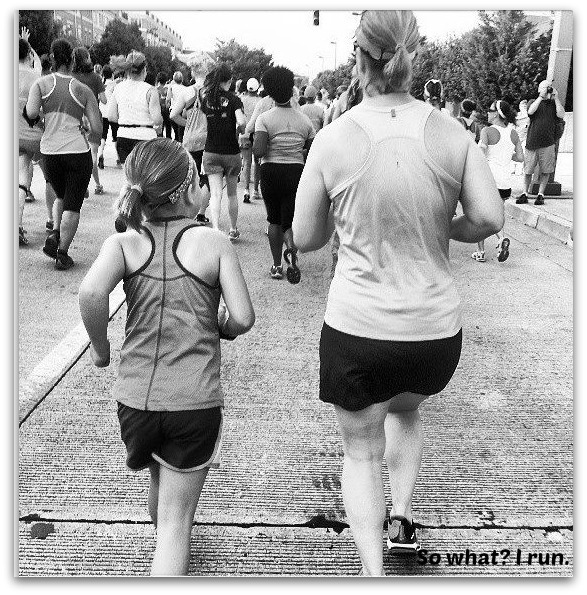 This entry was posted in Running and tagged Body image, childhood obesity, Physical exercise, Running by SoWhatIRun. Bookmark the permalink. How old do you think kids should be to start? I want to encourage, but not have them hate it, too. We put our 5 and 3 year olds in a 1K Fun Run this year – with mixed results. But they did it, and we all laughed later. I love this! I can’t wait to get my children out there too! My son, who is 4 would LOVE this. My daughter is 2…so I’m going to wait just a little bit longer. Great inspiration and role modeling!